Researchers have found that a solid oxide protective coating for metals, when applied in sufficiently thin layers, can deform as if it were a liquid, filling any cracks and gaps as they form. Image: Christine Daniloff/MIT. 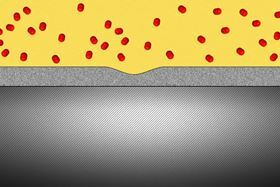 Researchers have found that a solid oxide protective coating for metals, when applied in sufficiently thin layers, can deform as if it were a liquid, filling any cracks and gaps as they form. The thin coating layer should be especially useful for preventing leakage of tiny molecules that can penetrate through most materials, such as hydrogen gas that can be used to power fuel-cell cars or the radioactive tritium (a heavy form of hydrogen) that forms inside the cores of nuclear power plants. Most metals, with the notable exception of gold, tend to oxidize when exposed to air and water. This reaction, which produces rust on iron, tarnish on silver, and verdigris on copper or brass, can weaken the metal over time and lead to cracks or structural failure. But there are three metal oxides that can actually serve as a protective coating to prevent any further oxidation of the metals underneath: aluminum oxide, chromium oxide and silicon dioxide. Ju Li, a professor of nuclear engineering and science at Massachusetts Institute of Technology (MIT) and senior author of a paper in Nano Letters describing the new finding, says "we were trying to understand why aluminum oxide and silicon dioxide are special oxides that give excellent corrosion resistance." The team, led by MIT graduate student Yang Yang, used highly specialized instruments to observe in detail the surface of metals coated with these ‘special’ oxides to see what happens when they are exposed to an oxygen environment and placed under stress. While most transmission electron microscopes (TEMs) require that samples be studied in a high vacuum, the team used a modified version called an environmental TEM (E-TEM) that allows the sample to be studied in the presence of gases or liquids of interest. The researchers used this instrument to study the process that can lead to a type of failure known as stress corrosion cracking. Metals under stress from pressure inside a reactor vessel and exposed to an environment of superheated steam can corrode quickly if not protected. Even with a solid protective layer, cracks can form that allow oxygen to access the bare metal surface. From there, the oxygen can penetrate into interfaces between the metal grains that make up a bulk metal material, causing further corrosion that can penetrate deeper and lead to structural failure. "We want an oxide that is liquid-like and crack-resistant," Yang says. It turns out that the old standby coating material, aluminum oxide, can have just the desired, liquid-like flowing behavior, even at room temperature, if it is made into a thin enough layer, about 2–3nm thick. "Traditionally, people think that the metal oxide would be brittle" and subject to cracking, Yang says, explaining that no one had demonstrated otherwise because it is so difficult to observe the material's behavior under realistic conditions. That's where the specialized E-TEM setup at Brookhaven National Laboratory, one of only about 10 such instruments in the world, came into play. "No one had ever observed how it deforms at room temperature," Yang says. "For the first time, we've observed this at nearly atomic resolution," says Li. This approach demonstrated that, when made exceedingly thin, an aluminum oxide layer – normally so brittle it would shatter under stress – is almost as deformable as a comparably thin layer of aluminum metal. When the aluminum oxide is coated onto a surface of a bulk piece of aluminum, the liquid-like flow "keeps the aluminum covered" with its protective layer, Li reports. The researchers demonstrated inside the E-TEM that the aluminum with its oxide coating could be stretched to more than double its length without causing any cracks to open up, Li says. The oxide "forms a very uniform conformal layer that protects the surface, with no grain boundaries or cracks," even under the strain of that stretching, he says. Technically, the material is a kind of glass, but it moves like a liquid and fully coats the surface, as long as it is thin enough. "People can't imagine that a metal oxide can be ductile," Yang says, referring to a metal's ability to be deformed, such as being stretched out into a thin wire. For example, sapphire is a form of exactly the same material, aluminum oxide, but its bulk crystalline form makes it a very strong but brittle material. The self-healing coating could have many potential applications, Li says, noting the advantage of its smooth, continuous surface without cracks or grain boundaries. A single-molecule-thick layer of aryl diazonium can both prevent phosphorene degrading in open air and enhance its electronic properties.